How to get to Grenoble? Grenoble is easily accessible from Lyon Saint-Exupéry or Geneva Cointrin international airports via direct shuttle connections (1 hr from Lyon Saint Exupéry, 2 hrs from Geneva Cointrin, tickets available at the airports). A direct TGV train line also connects Paris to Grenoble in 3 hrs, from the main train station (Gare de Lyon) or the Roissy-Charles de Gaulle international airport. The summer school will take place on the University campus of Saint-Martin-d'Hères, 15 minutes away from Grenoble town center by tram (line B or C on the map below). 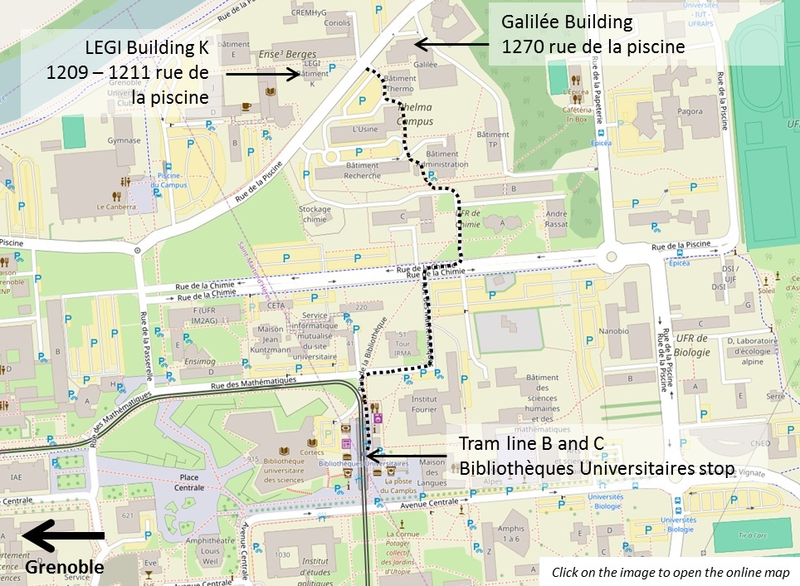 The venue is 5 minutes' walk from the "Bibliothèques Universitaires" tram station following the dotted path on the map below.